Surfrider Foundation Ventura County Chapter hosts monthly public beach cleanups and volunteers collected over two tons of litter off local beaches in 2016! The beach cleanups are organized in order to reduce the amount of trash on our beaches and in our ocean. In 2016, a total of 12 beach cleanups (1 per month) were organized by Surfrider VC Chapter. Specifically, 11 of the beach cleanups were held at C Street/Surfers’ Point and 1 cleanup was held at Ormond Beach (February 2016). Collectively, a total of 4,028 lbs. of trash were collected from our local beaches by volunteers in 2016. The number of beach cleanup volunteers went from 287 in 2013 to 1,082 in 2016. This increase in participation is largely attributed to advertising resulting from a partnership with the City of Ventura. On average, there were 90 volunteers/month. December saw the smallest turnout with only 34 volunteers while April had the biggest turnout with 170 volunteers followed by October with 140 volunteers. On average, each volunteer collected nearly 4 lbs. of trash. One of the most notable changes observed when comparing 2015 data (Figure 3.) 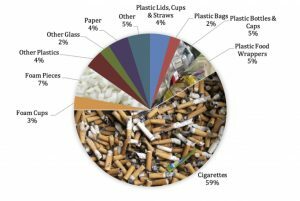 to 2016 data is that cigarette butts accounted for 59% of items collected in 2016, whereas in 2015, cigarette butts accounted for only 34% of items collected. This increase is most likely due to a change in collection methods for cigarette butts in 2016. In an effort to improve the accuracy of the number of cigarette butts collected, the methods used to collect and count cigarette butts were modified in 2016. Specifically, approximately 20 buckets were provided to beach cleanup volunteers and they were asked to use the buckets only for cigarette butts. This method allowed us to easily and accurately estimate the number of butts that had been collected. However, we did not use similar collection techniques for other items so it is possible that other types of trash are under reported since all other trash is commingled and we rely on volunteers to estimate how many of each item they collect on data cards. Other notable items collected during 2016 beach cleanups were syringes (28) and dead animals observed (44). Click Here for the full report.